Former Colombian defense minister Juan Carlos Pinzon warns of security "backslide"
As Colombia's newly elected president, Iván Duque, takes office this week, the country's former defense minister is warning that it could face a "backslide" in national security. He says more must be done to address the resurgence of illicit drugs, preserve some functional elements of the historic FARC peace agreement, and to stem the fallout of intensifying political turbulence in Venezuela. "No doubt that security is better today than it was ten years ago," said Juan Carlos Pinzón, who also served as Colombia's ambassador to the United States from 2015 to 2017. "But if we don't watch that and we do not correct what is necessary to correct, we might backslide a little bit – and this is what you don't want." "You want to keep moving forward," Pinzón said. Duque, who in June became Colombia's youngest president to be elected in more than a century – and who is a close associate of former conservative president, Álvaro Uribe – has been sharply critical of the landmark peace deal reached in 2016 with FARC leaders. 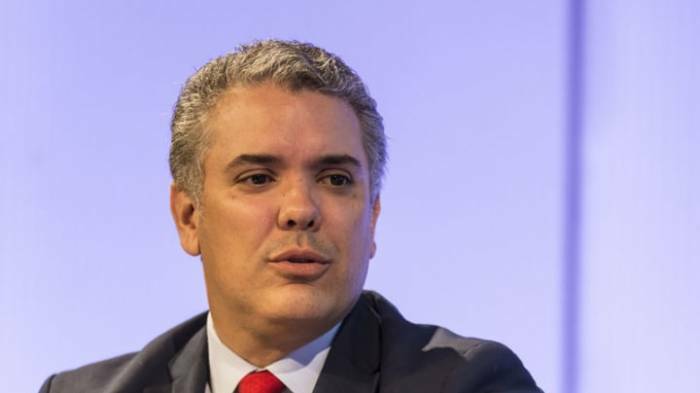 Duque has called for "structural changes" to the peace deal which, his critics have said, could endanger the viability of the deal itself. The agreement ended five decades of conflict between the Colombian government and FARC, a leftist rebel group with ties to drug traffickers, that had caused some 220,000 deaths. In an interview with "Intelligence Matters" host and CBS senior national security contributor Michael Morell, Pinzón, who in 2017 launched his own unsuccessful bid for the presidency, said certain parts of the deal – as well as the country's overall response to narcotics trafficking – do merit reevaluation. "The return of [the] cocaine business as a way of life that not only might benefit the FARC, but others, [is] a challenge," he said, "And we better tackle that soon." "Second," he continued, "incentives: There is, for many criminal organizations and structures, the idea that the end, despite your crimes, you might get some treatment. I think at some point we have to make a clear statement on where is the red line that nobody else can cross again." In opposing parts of the agreement, Pinzón has broken with the former president he served. Juan Manuel Santos, who won the 2016 Nobel Peace Prize for brokering a deal to end Colombia's decades-long war with FARC leaders, leaves office with historically low approval ratings that were in large part fueled by popular opposition to the deal's terms and implementation. "I will have always positive and warm sentiments for…the president," Pinzón told Morell. "But definitely, when you are responsible for policy and when you are responsible for leadership, always you have to keep yourself with the country and with your values." He applied the same view, he said, to the crisis in Venezuela, which has triggered an exodus of migrants – over half a million of whom have sought refuge in Colombia. "We should be very welcoming to these people," Pinzón said. "These are our Venezuelan brothers." "But…we have to be pragmatic," he continued. "What has this brought to Colombia? More people competing for public services, social services, it is creating a competition for jobs and at the same time, it is creating a security challenge." "This is not good and this creates some unrest from regular people in the streets," Pinzón told Morell. "I think we need to be more effective and careful about it." In May, the Trump administration announced more than $18 million in bilateral funding for displaced Venezuelans in Colombia, where the United States has generally benefitted from widespread popular approval. "When you talk to the business community…in Colombia, they like [President Trump] very much," Pinzón said. "They openly say they see pragmatic policies, pro-business policies." He added: "I think we got to wait a little bit to see long term the more real implications of what is going on."